Christie Contemporary is pleased to present Still, opening Friday, November 24 and continuing until January 6, 2018, featuring the work of Marla Hlady. Still (from ‘The Conversation’) uses individual frames from Francis Ford Coppola’s seminal 1974 sound-focused film, The Conversation, as a way to explore drawn sound. This ongoing series, currently numbering thirty-seven drawings, features auditive “events” rendered in ink and graphite in combination with, and responding to, sites of action pictured in the inset images. The cinematic frame is made compact to the drawing sheet, its position shifting from one drawing to the next, with the drawing similarly dislodged from regularity, where one work may be almost entirely worked in graphite, another tracing a thin, painted line of ink to its exhaustion mid-sheet. The implied movement in both filmic image and drawn, sonic trajectories solidifies in the durational — a range of moments held still, but crackling. Still asks questions such as, how can mark-making be used to describe a sonic event when sound is only knowable as a discrete event, when it is no longer audible? Drawing holds time differently than a snapshot. What happens when two different representations of time are combined? The small machine sculpture, Momentary (Jack Tar Hotel 3 o’clock), renders time and sound in visible concert. Set atop a meticulously fashioned butternut wood box, the exposed mechanics of a ‘70s era flip clock cycle through endless twenty-four hour periods at varying speeds. As time either careens or crawls toward 3pm in each irregular cycle, an audio clip is activated, migrating sound from earlier points in The Conversation to play at the clock time of the film’s building action to a murder scene in the Jack Tar Hotel. While the murder is not the climactic moment of the film, it is pivotal to the meaning of the “collected sound” in the film’s larger soundscape and reveals the interpretive pitfalls of the overheard. The arrhythmic clicking of the clock’s progress — where we “hear” minutes and hours, as we might only customarily hear seconds ticking — similarly delivers an aural tug to expectation, but preserves sound’s satisfaction as direct experience. The video work, also titled Momentary (Jack Tar Hotel 3 o’clock) features a slow zoom in to the object clock of the sculptural work, shown sitting on a counter in the artist’s studio, which slyly mimics the workspace of Gene Hackman’s sound surveillance expert in the film. 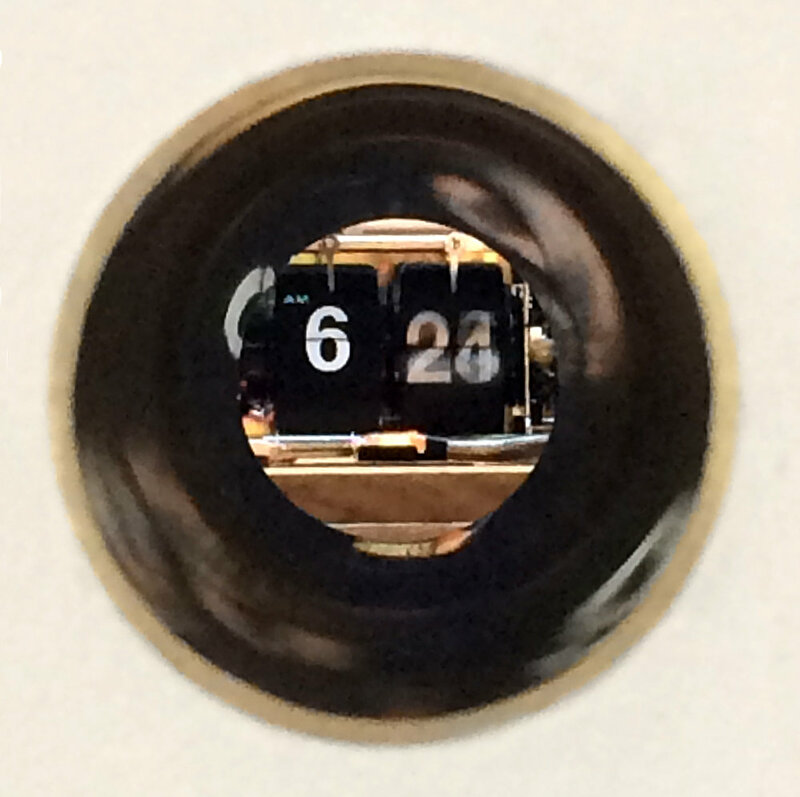 There is no sound here, but the idea of surveillance is maintained through the viewing apparatus of the peephole. Watching time, not so much unfold, as unravel, one is reminded that duration does have varying velocity in experience, and that sound, too, has a range, one that includes silence as a volume.